Adding a FixMyStreet feed to your Facebook page is not difficult, but you do need to be an administrator for the page you want it on. Also, it is a multi-step procedure. In other words, you might like to fetch yourself a cup of tea before following along with the instructions below. Does your Facebook page deal with a particular city or town, or an area within that town? 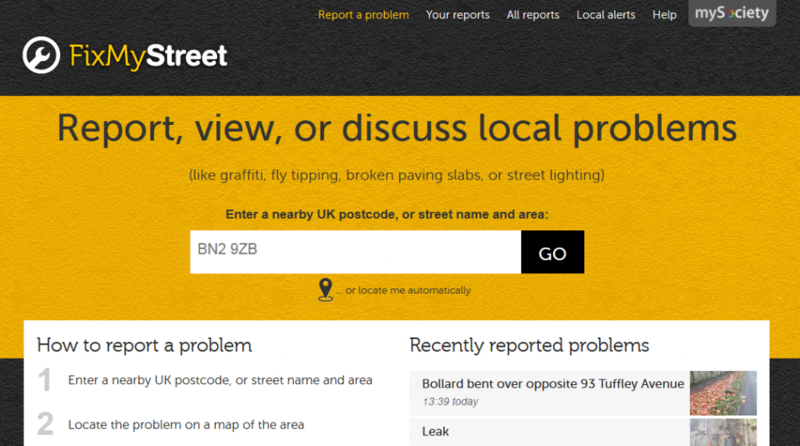 You’ll probably want to publish the FixMyStreet reports that are made within that area. The wider the area you choose, the more reports you will be publishing, so think carefully about what your followers will actually want to see on your Facebook stream. 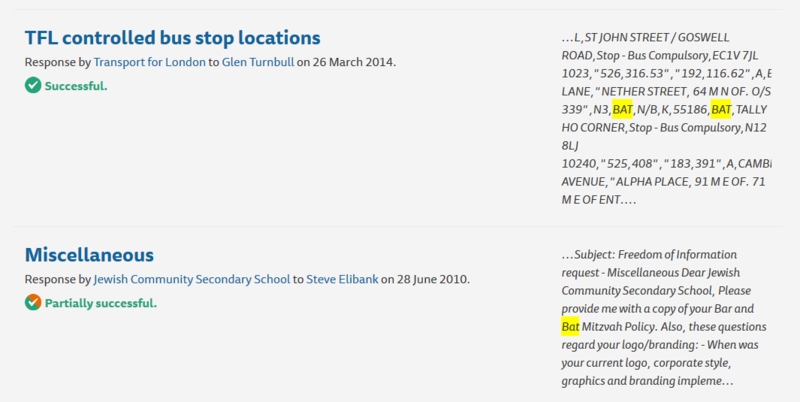 Once you’ve decided, locate that area on FixMyStreet by putting a postcode or place name into the box on the homepage. It doesn’t need to be precise; you just need to locate any spot within the area that you want to cover. You’ll be taken to a page showing all recent reports for the surrounding area. Don’t worry if this isn’t the exact area that you want your feed to cover, so long as you’re at a point within that area – we’re going to refine that in the next step. You can click and drag the map or zoom in and out if you’re not quite within the area that you want to be. At the very foot of the FixMyStreet page, below the list of reports on the left, you’ll see a little icon marked “get updates”. Click on this. Choose which option most closely matches the area that your Facebook page deals with, and click the green button marked ‘Give me an RSS feed’. 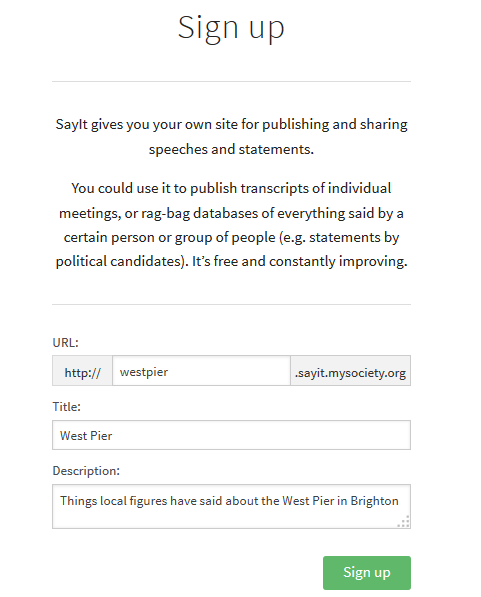 It’s basically just the data from FixMyStreet, with none of the site’s styling or functionality around it. This is what we need Facebook to grab and publish on your page. You will need the URL (web address) of this page in a short while – just keep it open while you go through the next steps. You don’t need to be logged in as the page that you want the feed on; it’s fine just to be logged in as yourself, the administrator of that page. 5. 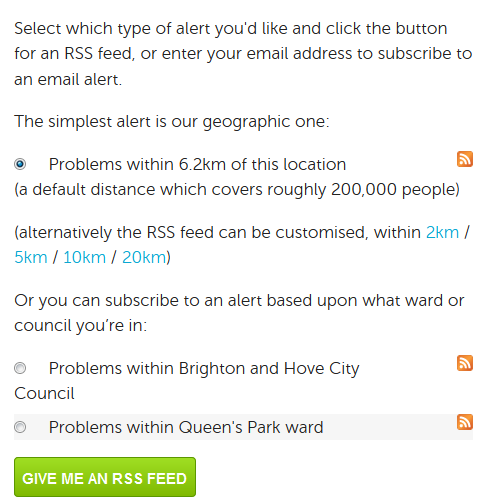 Connect an RSS action to your Facebook page In order to publish FixMyStreet reports, you’ll be using what’s called an RSS feed – a stream of data that can be picked up and published anywhere else. In this case, the data stream is found on what you saw in step 3: the ‘bare bones’ FixMyStreet page; and the target for publication is your Facebook page. Facebook itself does not provide a way to publish RSS feeds, so we’re going to use a service called IFTTT. 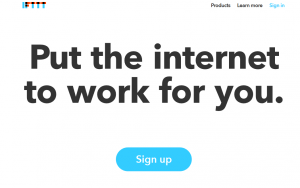 IFTTT stands for ‘If This, Then That”, and it’s a really nifty, free service that basically allows you to say: “Every time [something] happens, do [something else]. We are going to use it to say “Every time a new post appears in the RSS feed that I specify, publish it to my Facebook page”. 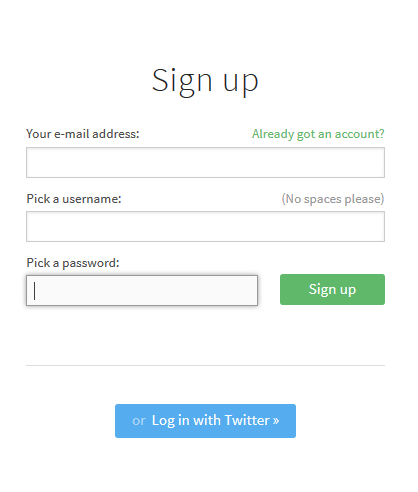 a) Sign up for an IFTTT account, if you don’t already have one. g) We’ve set up the first half of our ‘recipe’—the ‘IF THIS’. You can see it as the orange RSS feed sign in the sentence now. So next we’re going to tell the recipe what to do when that feed updates. IFTTT will take you through the steps of linking with Facebook and choosing which page to publish to. Just make sure you say ‘yes’ to everything. This format allows you to add a message to every item it publishes: probably a good idea, because it helps give context to these posts that are going to appear in your Facebook stream. 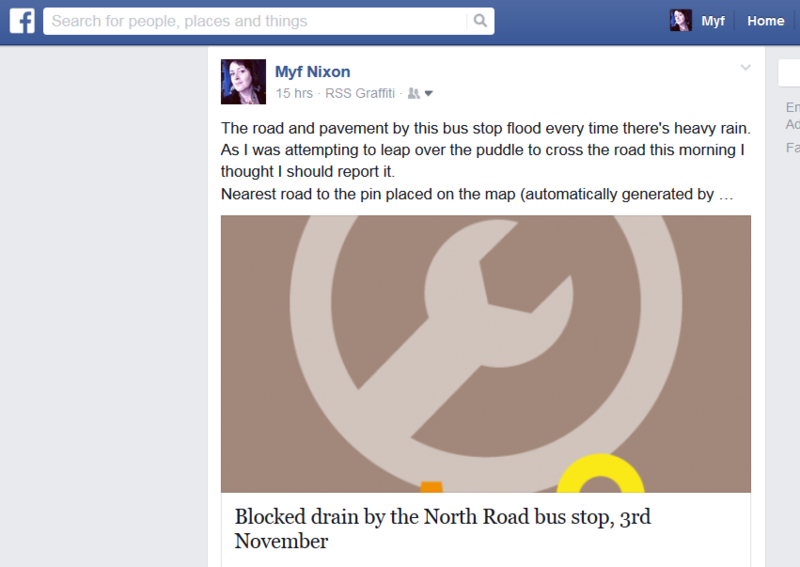 FixMyStreet reports are often written in the first person, so if they appear without a title or explanation, they may look as if they are posts from you yourself – take a look at the example at the top of this post and you’ll see what I mean. k) Click ‘create action’ and you’re done. 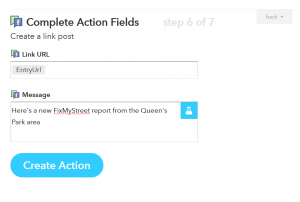 Note that your feed will not start publishing out until the next report is made on FixMyStreet. Do let us know in the comments below if you go ahead and install this functionality – plus any tips you might have. I connected to Facebook Pages, and assigned a Facebook Page I manage (a trial site). Then, later, I couldn’t figure out how to change to another Facebook Page I manage. After much delving, I found that people can change the Facebook Page to where the feed should go on this page. Also of note: I have also had a dabble with zapier.com which seems pretty good at doing the same thing. It offers a range of subscription plans ranging from free. 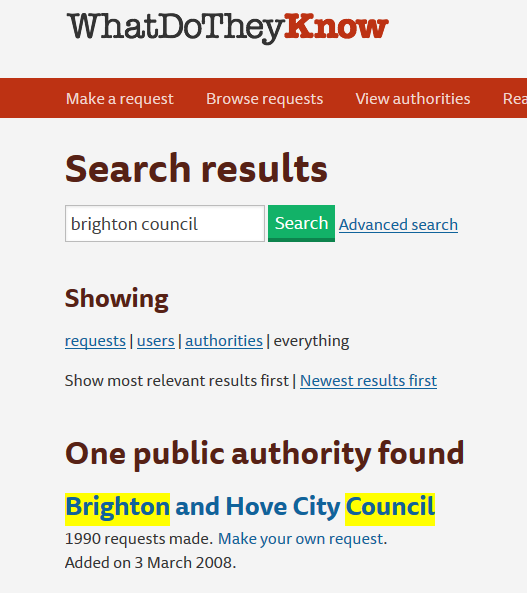 In a recent blog post, we showed how to subscribe to Freedom of Information requests made to your local council on WhatDoTheyKnow.com. All good, but what if you’re interested in a topic, rather than an authority? Well, you can set up many different kinds of alert on WhatDoTheyKnow. 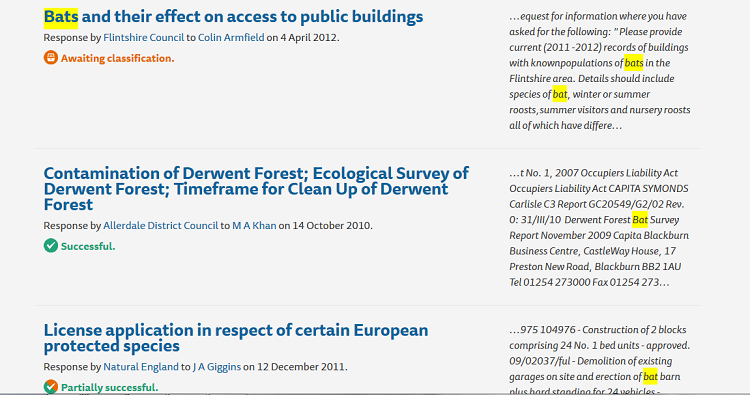 For example, you can opt to receive a daily email every time an FOI request or response contains your chosen keyword. If you’ve also subscribed to a specific body, you’ll receive the alerts all rolled into one email – in fact, however many alerts you set up, they’ll always be aggregated in this way, so there’s no need to worry about flooding your inbox. Let’s say, for the sake of an example, that you have a particular interest in bats – maybe you work for a bat conservation project, or you’re a student doing a thesis on bats. Whatever the case, you might find it useful to receive an email every time an FOI request is made about bats. 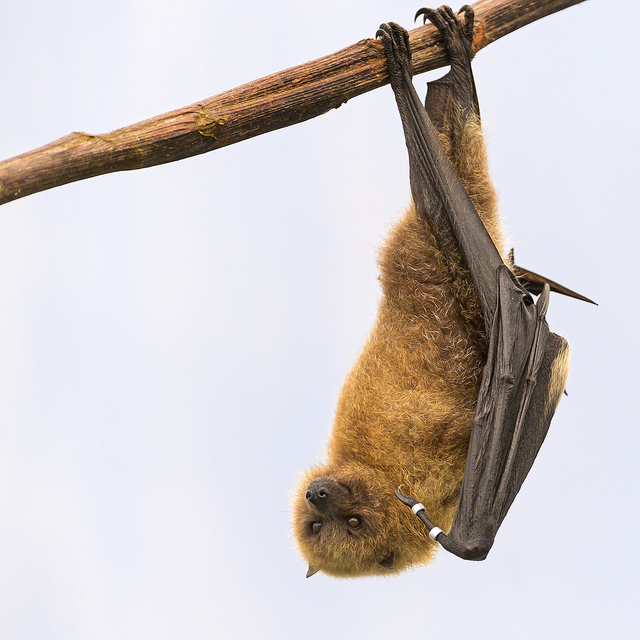 By subscribing to an alert, you’ll be tipped off if, for example, someone asks about bats causing an impediment to building works, or if new wildlife survey results are released in response to a request. Every alert begins with a search. Searching for ‘bats’ gives me almost 500 results of FOI requests where the word ‘bat’, ‘bats’ or ‘batting’ is mentioned – either in the request itself, or in the response. Some of the results contain different meanings of the word ‘bat’: there is one about Bat Mitzvahs, several about bus stops which have ‘BAT’ as part of a location code, and one response which mentions baseball bats as a crime weapon. We can refine these results, and make sure we only subscribe to the ones we want, with an Advanced Search – click on the link next to the search box to see how. WhatDoTheyKnow’s search engine can handle advanced search operators, and also a number of search types that are tailored to the site. For example, you can search within particular date spans, or within requests made by a specific user. If you scroll further down the Advanced Search page, you’ll also see that it’s possible to search for all requests within a certain status type (eg “successful” requests) – and all of these search operators can be used in combination. Click the Search button again, and you’ll see that this process has weeded out the most obvious irrelevant results. 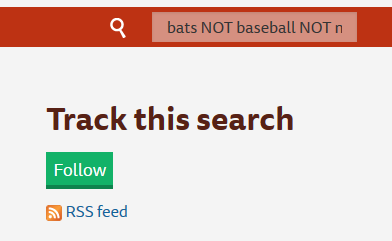 If I subscribe to this search string, I will receive an email alert every time (the right kind of) bats are mentioned in a request or response. In the example above, I will receive several alerts for each relevant FOI request, over several days, as it goes through the process of getting a response. 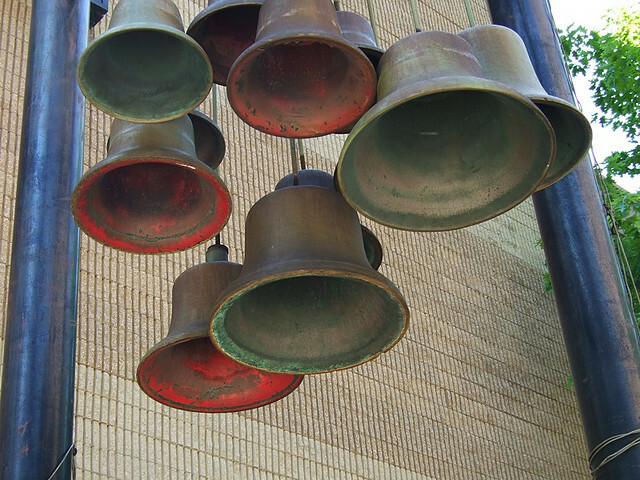 I’ll get one when the request is first made, one when the authority respond to say that the request has been received, one when a response is made, and potentially others, if there is any more correspondence going back and forth, for example in the case of a request for an internal review. bats NOT baseball NOT mitzvah NOT bus status:successful. Now your search results will only find those requests where a response has been received, and the user has marked that it answered their question adequately. You can see the various statuses available here. Once you have refined your search results to your liking, you are ready to subscribe. 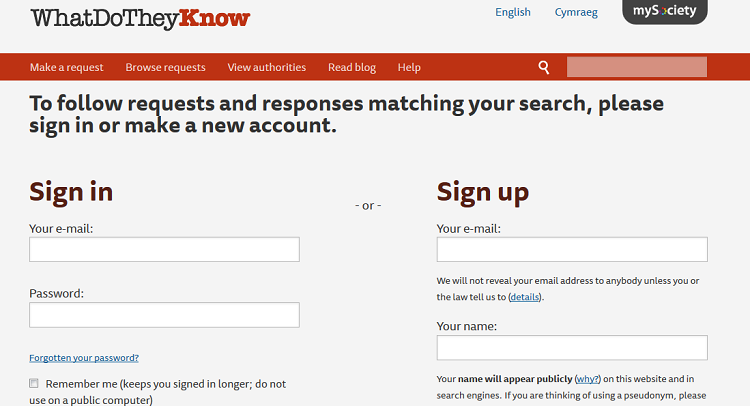 If you already have a WhatDoTheyKnow account, all you need to do is log in, and you’re done – your alert has been set up. If you don’t have an account, it’s as simple as filling in your email address, name, and picking a password. The site will then send you a confirmation email with a link in it – clicking on this helps to confirm that you are a real person, and that you have entered a genuine email address – which you’ll need, if you are going to receive alerts! Now all you have to do is wait for our alerts to come into your email. 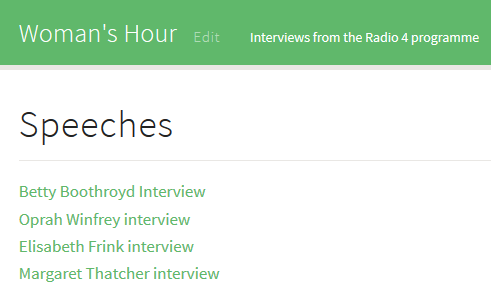 You can set up as many as you like, for as many topics or authorities as required. Every email has a link at its foot, allowing you to delete your alerts when you’ve had enough. If you want to stop receiving one or more of them, just click ‘unsubscribe’. Let us know whether you find this service useful, and how you’re using it! It’s surprising how many people know about our websites, but haven’t heard about one of their useful features: email alerts. Someone makes a FixMyStreet report within your chosen area. What do most people subscribe to? 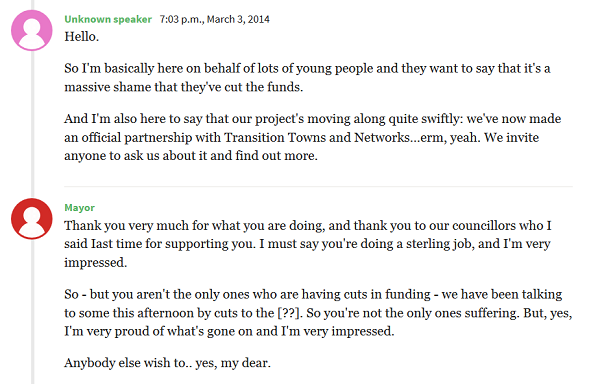 Mentions of their own town or city; speeches by their own MP; and FixMyStreet reports within their own area. It makes sense – of course we are interested in the issues which affect our own community. 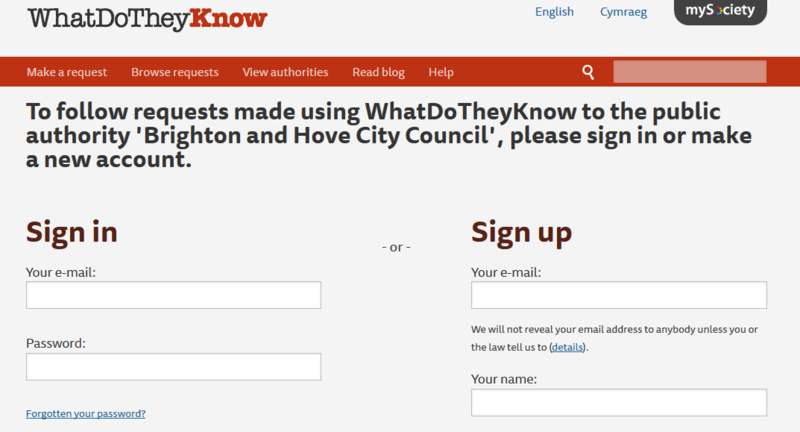 Now here’s another way to be the first to know about what’s going on in your local area: you can subscribe to alerts from WhatDoTheyKnow.com, and receive an email every time someone makes a request for information to your local council (or any public authority of your choice). 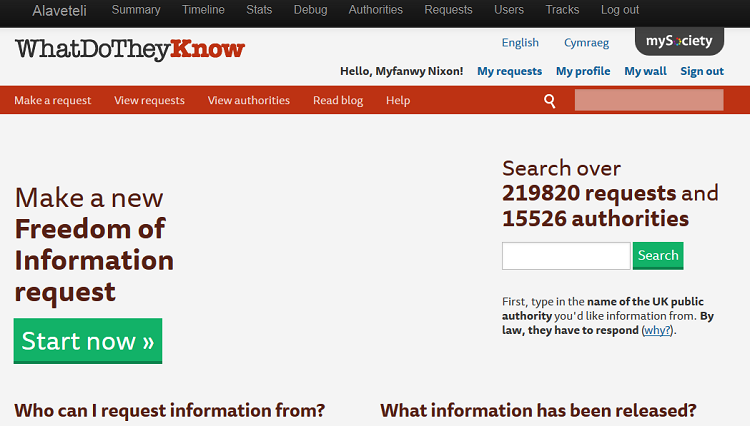 WhatDoTheyKnow is our Freedom of Information site. 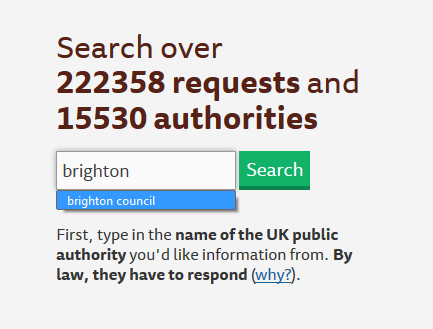 It allows people to ask for information from public bodies such as councils, state schools, the NHS, et cetera – and it publishes both the requests and the responses. If you ‘follow’ your own local authority, the site will automatically send you an email whenever anyone makes a request to it (condensed into a daily digest). Because people use the Freedom of Information act to find out about things that really matter to them, these alerts can be a great way of keeping up with local concerns. If you’re a journalist, a councillor, a local activist or just an interested member of your own community, they can be both fascinating and invaluable. The homepage is at www.WhatDoTheyKnow.com. 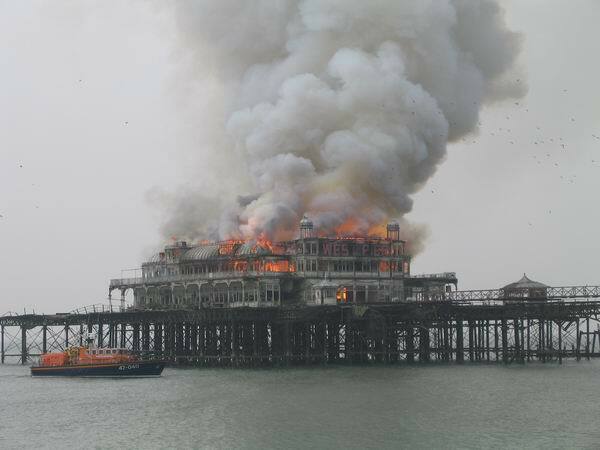 In this case, there is only one result for my search term, ‘Brighton Council’. Below this result, I can also see previous FOI requests made to my council. Here’s where I get a taste of why this alert subscription might be so useful and interesting to me, as a local resident. There are requests about bus subsidies, allotment waiting lists, council salaries, school catchment areas… and lots more. If you prefer, you can refine your search results by selecting “requests”, “users”, or “authorities” below the search box – in this exercise, we are looking for your local council, so you should click “authorities”. 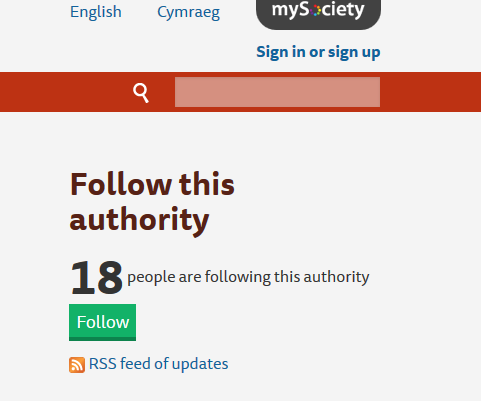 On the right hand side of the page, you will see the title: “Follow this authority”, then the number of people who are already doing so, and a green ‘Follow’ button. This button allows you to sign up for email alerts. 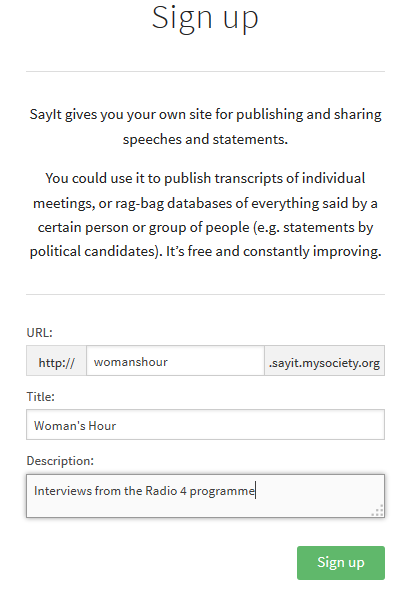 Below it, as you can see, there is also an option to access an RSS feed – this is useful if you use a “Reader” or “News Aggregator” to keep up with blogs and other feeds from a variety of sources. But today, we’re signing up for an email alert, so click the green button. At this point, we ask you to sign up or sign in. 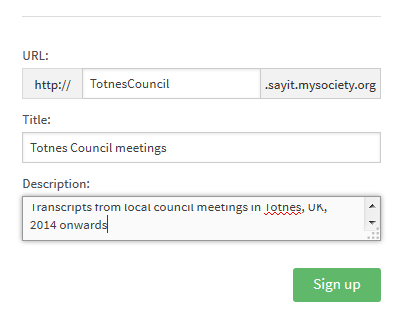 You are now registered, and you’ll receive an email once on every day that anyone makes a request to your local council, or an existing request is updated (eg the council responds, or someone leaves an annotation). Every email alert has a link at its foot, which you can follow to ‘manage’ your alerts: if you want to stop receiving one or more of them, just click ‘unsubscribe’. Of course, you don’t have to limit yourself to your own council. If you have a particular interest in any authority – perhaps your children’s school, a government department, or local public bodies- you can sign up to alerts in exactly the same way. No matter how many alerts you subscribe to, they all arrive in just one email, so they won’t clog up your inbox. In a forthcoming blog post, we’ll also be looking at how to subscribe to topics or keywords, and how to use operators to get a slightly more refined alert. 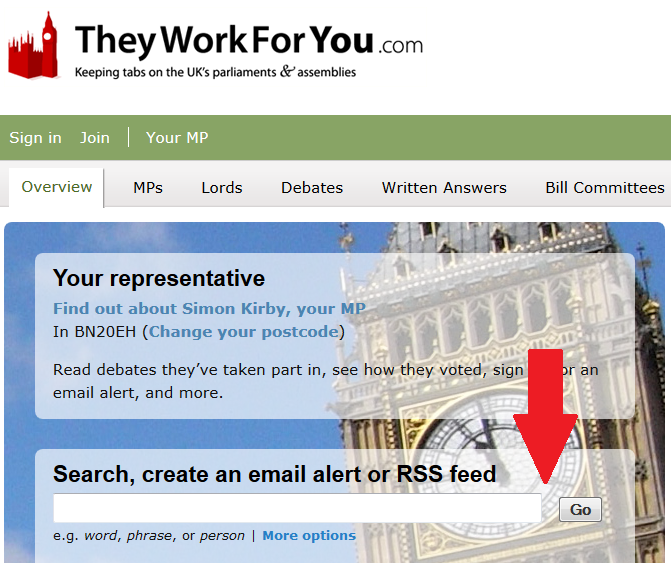 In our two previous blog posts, we’ve looked at how to set up alerts on TheyWorkForYou.com so that you receive an email whenever your chosen politician speaks in Parliament, or whenever your chosen topic is mentioned. Now we’re going to look at how to manage your alerts, and how to make sure you have the right type of alerts set up for your needs. Perhaps surprisingly, you don’t need to register for an account to receive alerts from TheyWorkForYou (although if you do create one, it’s quicker and easier to manage your alerts). This link is unique to you, and by following it, you will be able to see the alerts to which you are subscribed. Beside each of your alerts, you will see buttons marked “Suspend”, “Delete”, or “Resume”. 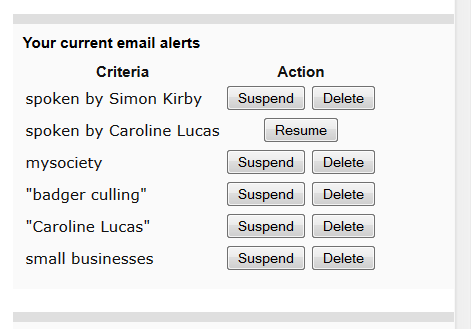 Suspend allows you to stop the alert emails temporarily – they will remain switched off until you click ‘Resume’. This function is helpful if you only want to follow topics during a set time, for example the run-up to elections – or perhaps you want to cut down the number of emails you get while you are away on holiday. Delete stops your email alerts for good, and removes them from your list. 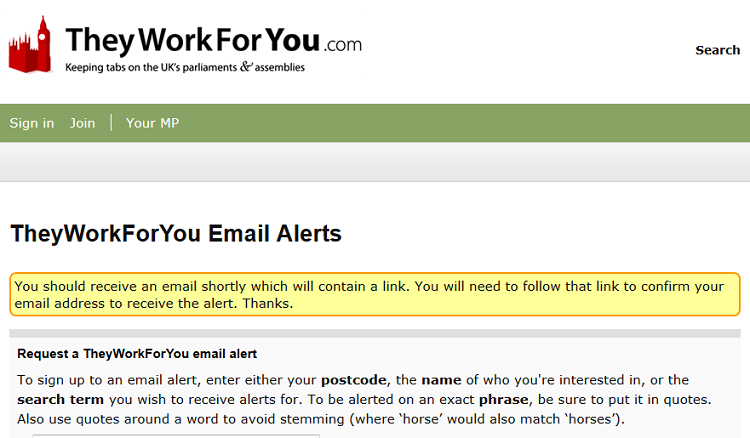 Spoken by Simon Kirby – the user will receive alert emails when Simon Kirby MP speaks in Parliament. Spoken by Caroline Lucas – the user will not receive emails for this alert, because it has been suspended. 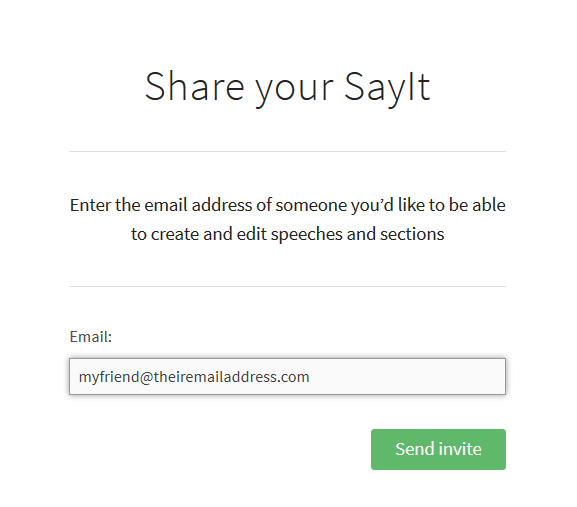 mysociety – the user will receive emails whenever the word “mysociety” is mentioned. “badger culling” – because of the quotation marks, the user will receive emails whenever the phrase badger culling is mentioned. The user will not receive alerts if the two words ‘badger’ and ‘culling’ are mentioned separately, or if, for example, a phrase like “cull badgers” is used – so this alert may not be the best for their needs. 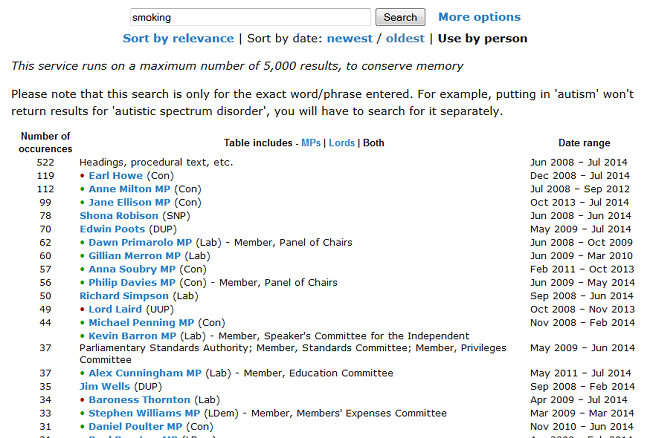 “Caroline Lucas” – the user will receive an alert every time Caroline Lucas’ name is mentioned by someone in Parliament. This is probably not the intention; it’s a common error to subscribe to mentions of someone’s name rather than their speeches. small businesses – this is a poor alert. 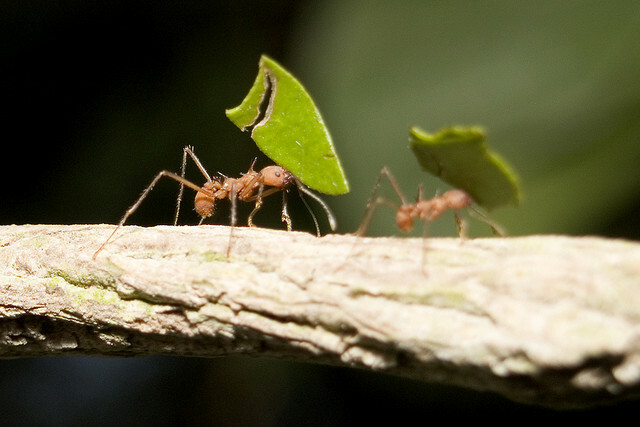 The user will receive emails every time the word ‘small’ is used in the same speech as the word ‘businesses’ (or business), even if the two words are not together. So, if someone happened to say ‘It’s a terrible business’, and then, a bit later, ‘small wonder’, an alert would go out. This alert would be better if the words were enclosed in quotation marks: “small businesses”; in that case, it’s probably also best to add one for “small business”. If you have spotted mistakes in your alerts, simply delete the erroneous ones and follow the instructions below to create improved ones. On the left of that same page (or http://www.theyworkforyou.com/alert/ if you have not come via a link in your alert email), you can set up new alerts for people or for keywords. If you have come to the page via a link in your alert email, you will not need to input your email address again – the system knows who you are. Otherwise, provide your email address, and click on the link in our confirmation email. – you’ll be asked to decide whether you want to receive alerts when they speak (“Things by…”) or when they are mentioned (“Mentions of…”). If required, you can use Boolean searches in your alert set-ups. For example, if you would like to receive alerts when badgers are mentioned, but not owls, input badger -owl. If you would like to receive alerts when either owls or badgers are mentioned, you can either set up an alert for each term, or you can enter owl OR badger. “Or” must be in capital letters so that the system knows it’s not part of the search term. If you would like to receive an alert only when badgers and owls are mentioned in the same speech, input both words: badger,owl. If you anticipate setting up many alerts, or wanting to manage them closely in the future, you may wish to set up a TheyWorkForYou account. This also allows you to add annotations to the site, contribute to the glossary, and change your email address if you need to. Simply visit this sign-up page. Registering will not change any of the alerts you already have set up – you’ll be able to view and manage them as before. You can change the email address that alerts get sent to, if you are registered on the site. Just visit your profile page, and edit the email address field. Email us at support@theyworkforyou.com and we will change it for you. 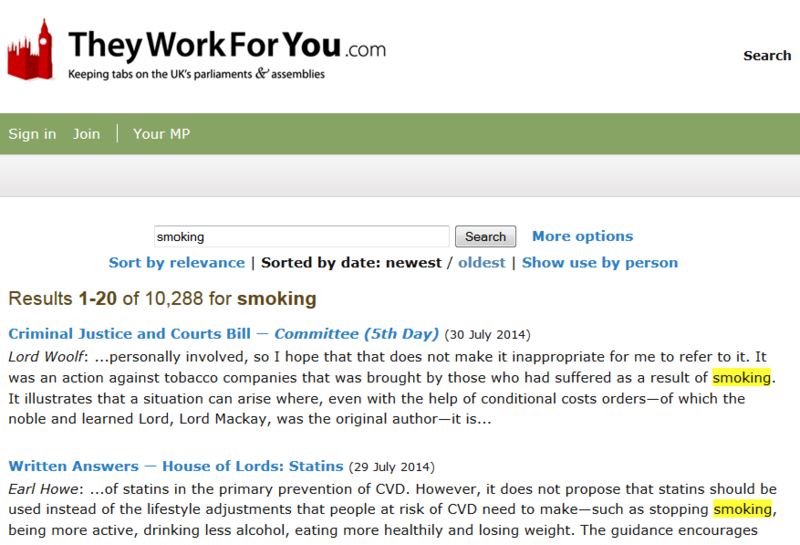 Parliament is back in session – that means that TheyWorkForYou.com will be filling up with lots of new content as our representatives come back to work and start on the rounds of debates, committees, and written answers. 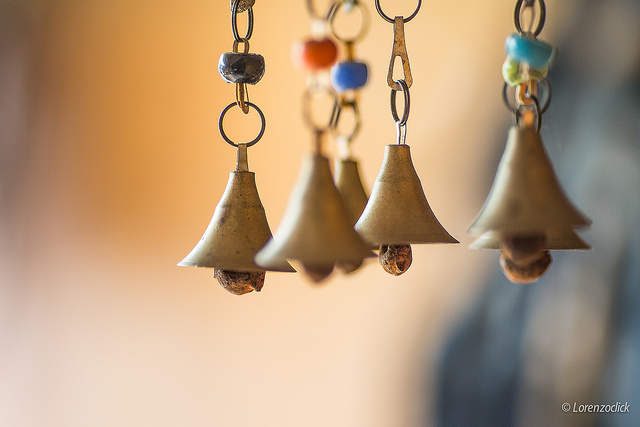 How do you keep up with the stuff that’s relevant to you? Well, you could read it all, every day – or you could be smart, and set up a topic alert. If you’re interested in a specific topic, and you’d like to receive an email every time someone mentions it in Parliament, follow these steps. Let’s say you’re particularly interested in badger culling, and you’d like to receive an alert every time the word ‘badger’ is mentioned in Parliament. Tip: If your chosen search term has more than one word, you may find it useful to put it inside quotation marks – otherwise you will receive alerts every time both words are mentioned, even if they are not mentioned adjacently. TheyWorkForYou uses ‘stemming’ – so these results contain mentions of words such as ‘badgers’ and ‘badgering’: again, if I want to only receive mentions of the word badger, and none of its derivatives, I should put the word in quotation marks. 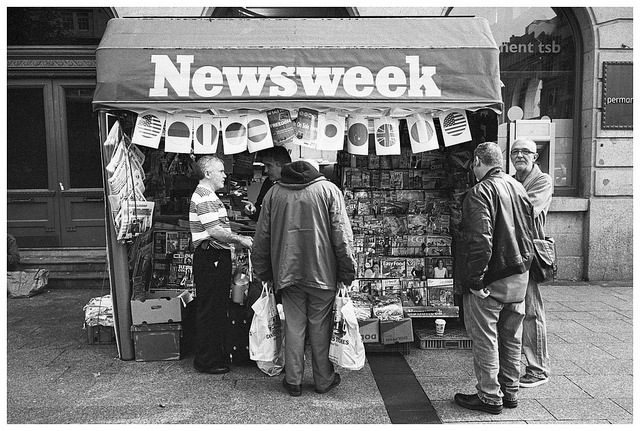 iii) Click on the large blue link to the right of the page: “Subscribe to an email alert for [your search term]”. 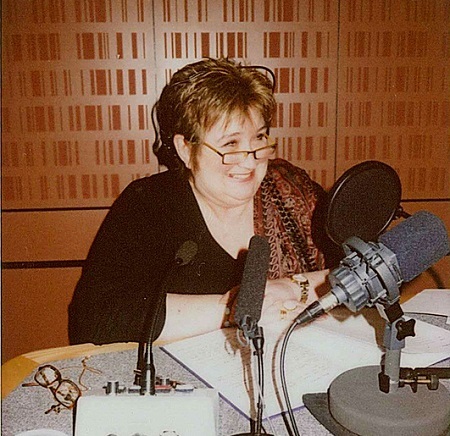 iv) If you are logged in to the site, that’s it – you’ve subscribed, and you don’t need to do anything more. If you are not logged in, don’t worry. You don’t need an account in order to sign up for alerts. We’ll send you a confirmation email. Click on the link in the email, and there you go – you’re subscribed. You can sign up for as many alerts as you like: if you are interested in many topics, it is probably worth registering, as you then do not have to go to the bother of inputting your email address and clicking the confirmation link for each one. In our next post, we will look at how to manage your alerts, and common mistakes that can be made setting them up. Prefer to receive alerts every time a specified MP speaks? See our previous post. Fifty years ago, in 1964, the causal link between smoking and lung cancer was confirmed by the Surgeon General in the US. That year saw many debates in Parliament on topics that have since become very familiar: the question of whether the tax on cigarettes should be raised; whether cigarettes should be advertised on television, whether smoking should be allowed in public places, and whether warnings should be printed on packets. 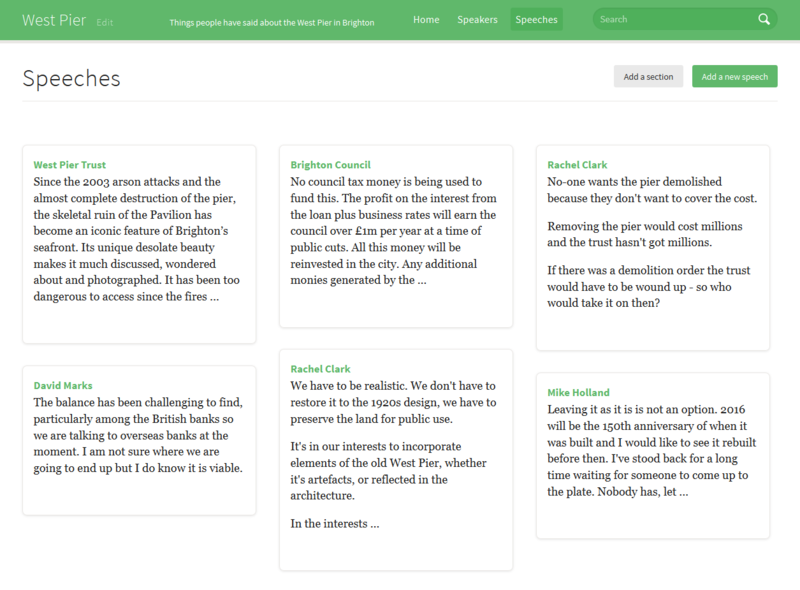 Rich and fascinating stuff for any social historian – and it’s all on TheyWorkForYou.com. Hansard, the official record of Parliament, is a huge historic archive, and whatever your sphere of interest, it is bound to have been debated at some point. Browsing through past debates is a fascinating way of learning what the nation was feeling: worries, celebrations, causes for sorrow – all are recorded here. TheyWorkForYou contains masses of historic information: House of Commons debates back to 1935, for example, and details of MPs going back to around 1806. You can see exactly what the site covers here. 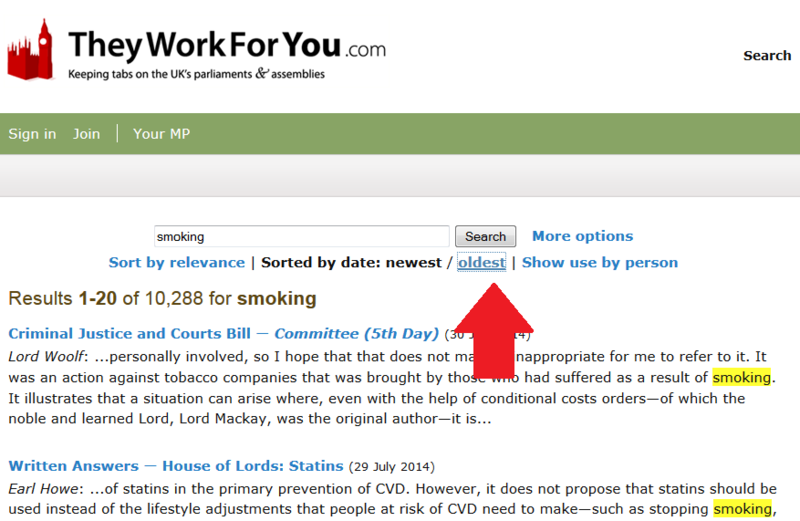 You can do a simple search right from this page, or choose ‘more options’ below the search box to refine your search. We’ll look at those advanced options later, but let’s see what happens when you input a simple search term like ‘smoking’. Here (above) are my search results, with my keyword helpfully highlighted. By default, search results are presented in reverse chronological order, with the most recent results first. 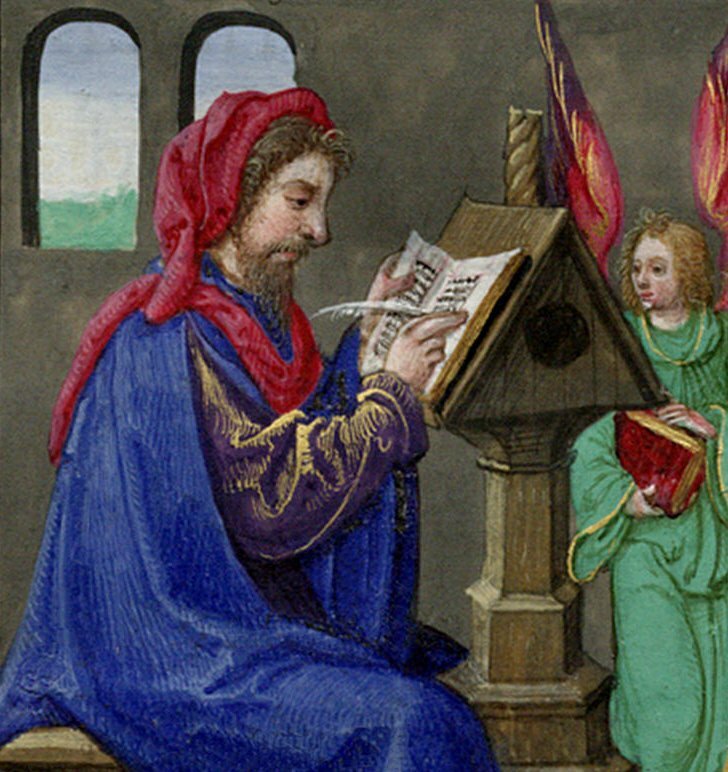 If you are particularly interested in historical mentions, you may wish to see the older mentions first. Sort by relevance orders your results with the most relevant ones first, as discerned by our search engine. This will give you those speeches with the most mentions of your keyword ahead of those where it is only mentioned once or twice. Click through any of the names, and you’ll see all the speeches where that person mentioned your keyword. That’s a good start – but what if there are too many search results, and you need some way to refine them? 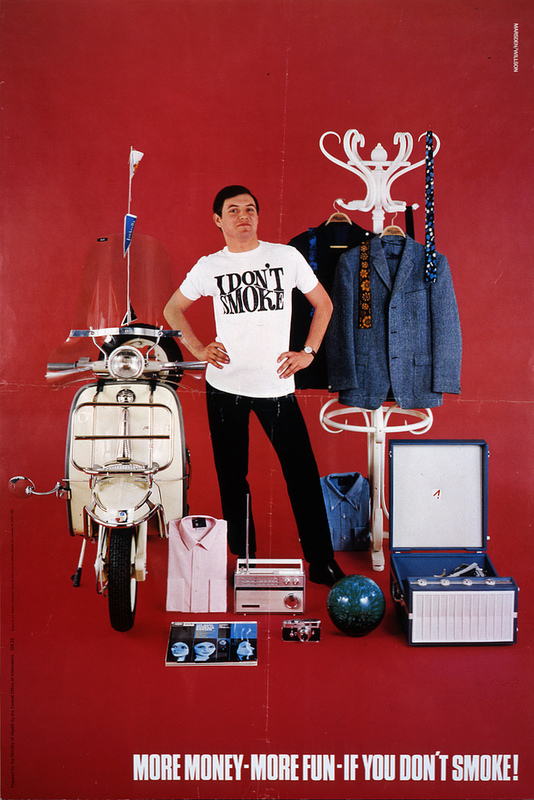 You’ll notice from my screenshots above that there are (at the time of writing) over 10,000 mentions of smoking. Whichever way you arrive at it, the Advanced Search page helps you really get to the content you’re interested in. The pink box on the right gives you some tips for effective searching. For example, just as with Google, you can search for exact phrases by putting your search term within quotation marks. Otherwise, your results will contain every speech where all your words are mentioned, even if they’re not together. For phrases like “high street”, this could make a real difference. Even if you are only searching for a single word, you can put it in quotation marks to restrict the use of ‘stemming’ – so, for example, a search for the word house will also return results containing houses, housing and housed, unless you put it in quotation marks. You can exclude words too: this can be useful for minimising the number of irrelevant results. So, for example, you might want to find information about the town of Barking, but find that many of your results are debates about dogs. Simply enter the search term “barking” -dogs. The minus sign excludes the word from your search. In the main body of the page, you’ll also see options to restrict your search to within certain dates, or a specific speaker, or a department, section (eg Scottish Parliament or Northern Ireland Assembly) and even political party. The best way to see what you can find is to dig in and give it a go. If your search doesn’t work for you the first time, you can always refine it until it does. Let us know if you find anything interesting!